Are you tired of spending hours scrubbing away to clean just one scorched pan? This trick will save you time and all you need is a dryer sheet. It happens to everyone. You forget the pan on a burner after you've finished cooking or forget to dry off your salmon before you sear it. Your pan is left covered in a thick, black and nearly impossible to clean layer of burned oils and sauces. 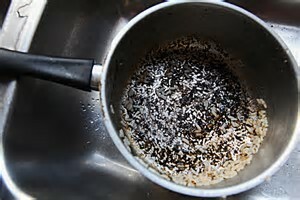 Fortunately, there's an easy way to clean a scorched or burned pan without the endless scrubbing. And it doesn't require any special cleaners. Here's how it's done. The best thing you can do when your food has stuck to a pan or you've scorched it is to start cleaning it right away -- even before you sit down to eat. The prep will only take you a second. Remove the pan from heat and fill it with warm water from the tap. Add about a teaspoon of dish soap to the pan as you fill it with water. Sit the pan on a trivet on the counter or an empty burner on the stove. Place a dryer sheet in the soapy water and make sure to fully submerge it. After it has sat for at least an hour, pour the solution out of the pan. The grime might not simply pour away, but the worst of it will definitely be loosened and much easier to wipe -- not scrub -- away. For problem areas that don't come clean, grab a non-scratch scouring pad or scrub sponge and clean as you normally would. After all the stains have been washed away, you'll want to give the pan a thorough cleaning, since you used a dryer sheet to help lift the stains. While this method requires several hours of waiting around for the dish soap and dryer sheet to do their job, the level of effort required by you is significantly less. You no longer have to spend hours over the sink scrubbing to clean just one pan. If you're also tired of scrubbing your blender clean every time you use it, there's a simple trick to speed up that process, as well.